Are you looking for the best automotive paint on the market? Painting metal, cars, aluminum, and rust can be tricky. Finding the best paint is essential to a job well done. We review the top paints that are available to you. From this list, you’ll be able to find the best paint for metal. We’ll also supply tips for the best paint for rusty metal and engines as well. How Do Different Paint Types Interact With Metals? What Should You Look for When Painting Metal? Can Paint vs. Spray Paint? Despite how tough metal is, it is regularly exposed to surface damage. With simple protection and a good paint job, you can protect your metal from these ailments. Paint is even capable of covering rust, tarnish, holes and blemishes. Metal is constantly being attacked by its environment. The airborne chemicals oxygen react with metal and turn it flaky. Most often metal will become corroded with rust. That is simply the reaction of moist air mixing with iron and steel. Galvanized metals will also rust but do so more slowly. Brass, silver, and bronze are capable of tarnishing as they are exposed to the environment. The right paints can help alleviate many of these issues. It is important to remember that you only want to use these products if they specify formulation for galvanized metal. Painting metal isn’t always the easiest task to perform. With the environment, the paint tends to erode, peel and crack easily. By choosing the best metal paint, you can have a new look. It also will help to protect the metal from future damage. Most metals will require treatment before painting. This will ensure that the paint sticks to the surface. Some metal paints will try to sell you on the fact that no priming is needed. I still recommend taking the time to apply primer. This is especially true if your item is going to see a lot of wear and tear. Follow the guidelines above and choose a paint specifically designed for your surface. You will find spray paint and liquid applications. When deciding whether to use a latex paint or oil-based paints, each has their own set of qualities. Latex paint is quick-drying but tends to chip. Oil-based paints take longer to dry but won’t chip easily. Oil-based paints also tend to fade more often. Even still, many experts claim that oil-based paints are the better option due to the durability. If you are painting something that will be washed, use glossy finish paint. You have two main options when you are looking to paint your car. You can use can paint or spray paint. While many people think that spray paint is a quick and easy solution, I am going to show you why it’s not always your best option. Using spray paint will take forever! Using a professional paint gun that has compressed air will give you a continuous flow which is metered. Spray cans on the other hand, just shoot paint at whatever rate the nozzle allows. It won’t spray at the same flow consistently. Your paint will end up completely random on the car. Then, you can plan to do some wet-sanding, spraying again and maybe even some more wet-sanding. The color you see on the spray can is not generally an accurate representation of what will come out. Quality control on spray cans isn’t as particular as can paint. If you use more than one spray can, it could be different from the previous can you’ve used. Spray paint was designed for small, short jobs. The nozzles aren’t made to handle blasting at a continuous rate. If you hold the nozzle for more than 15 seconds, you will likely experience a clog. Then, you can anticipate a dripping mess. The heat of your engine will cause spray paint to flake off the hood. In addition, rocks or debris from the road can easily chip the spray paint. Even when you use a clear coat, spray painting the car just prolongs the fact that you need a professional paint job. Spray paint would be a great way to touch up issues with your paint. Otherwise, it is our recommendation that you stick to using the proper can paint for your car’s needs. Then, invest in the best spray gun to apply the materials quickly and evenly for a professional looking appearance. Let’s get right down to the reviews you’ve been looking for. 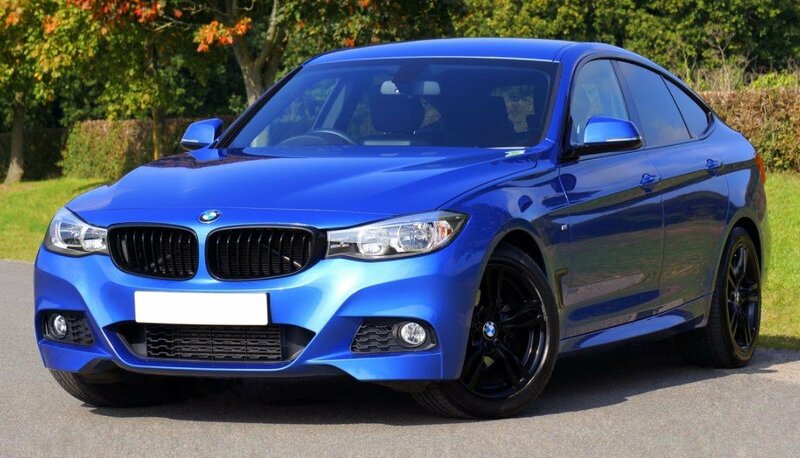 Here is the best automotive paint for a range of metals. This Dupli-Color Perfect Match Automotive Paint comes in a variety of colors. Because of this, you should be able to easily match your colors perfectly. The spray paint is easy to use and is high-quality. This automotive paint is a fast-drying acrylic lacquer aerosol paint. You’ll find that it is formulated to match the original factory color of your vehicle. This can features an adjustable EZ Touch 360-degree nozzle. It also has a wide spray pattern. Due to this, you will be able to spray smooth, even coats. You will want to apply this over your factory applied finish or Duplicolor Perfect Match Scratch Filler Primer. You can then finish with the Dupli-Color Perfect Match Clear Coat. Because of the potential issues listed previously, it would be best to use this paint as a touch-up method. Using it to spray the entire car could require the use of many extra cans and may not be as durable as regular paint. Want to find the best paint for rusty metal? This POR-15 is a high-tech and high-performance rust-preventive coating. Apply this formulation directly on the rusted areas. It also works well on seasoned metal surfaces. Using the POR-15 45404 prevents rust from recurring by protecting your metal from any further moisture. This is possible due to the fact that it dries to a rock-hard, non-porous finish. This finish won’t chip, peel or crack over time. In addition, the paint is available in multiple sizes so you can buy just what is needed. There are other uses for this paint. Consider it to be the best paint for metal roofs as well. Basically, any metal that you are concerned will rust, this is the formulation you need. It can be part of your essential needs arsenal, with your WD-40 and Duct Tape. Once you begin using this paint, you’ll find uses for it everywhere. This system is a truly unique, one-of-a-kind product for painting your vehicle. In fact, it is my top choice for automotive paint. DupliColor's Paint Shop Finish System gives you the ability to create high-quality finishes on any project. You will use with primer, color and clear to create the look you desire. The high-quality lacquer system is specifically designed for motorcycle and automotive applications. In addition, Paint Shop is easy to apply, even a beginner could do it. Paint Shop will dry quickly so you don’t have to worry about imperfections. When you are finished, you can buff it out for a brilliant, smooth finish. The ready to spray formulation means you don’t have to waste a lot of your time. There is no re-coat window. Choose from several varieties of colors to match any vehicle you are working on. In addition, there are a couple of sizes available so you only purchase what you need. The Rust Bullet formulation is one of the best paint for metal that you’ll find. There is little or no preparation required when you choose Rust Bullet for your automotive painting needs. Choose to apply the Rust Bullet formulation directly over the rust with a simple one-step process. The UV-resistant paint will not crack or fade over time. There is no topcoat needed when you apply the Rust Bullet. In addition, choose to brush, roll or spray on the Rust Bullet, whichever is best for you. Rust Bullet is available in several different colors to match whatever vehicle you are working on. It can also be purchased in a variety of sizes to fit your individual needs. The full cure time of this formula is 72 hours, so be sure to place the vehicle in an area that it can properly dry. Just keep in mind that Rust Bullet doesn’t come off easily. Because of this, you’ll want to ensure that you are wearing proper gear at all times. With this Rust-Oleum brand enamel paint, you can stop rust quickly. It is considered to be the best paint for outdoor metal furniture as well as other metal projects. The premium quality that comes from the Rust-Oleum brand is superior to all others. Available in a variety of colors, you will find exceptional coverage for all your projects. You can choose from neutral colors to deep, rich hues. Rust-Oleum paints are manufactured in the United States. They also are known for their durability. This enamel paint is resistant to chipping and fading as well. This formula is also usable on interior projects as well as exterior use. It is nationally VOC compliant and will offer you an elegant, smooth finish. There are many different size containers to choose from to suit any project you are working on. From metal furniture to metal hobbies, this enamel paint is sure to meet your needs. Some users have even mentioned that it is the best paint for metal doors. Another great choice from Rust-Oleum, the Professional Undercoating works great on underbodies, wheel wells, trucks, boats, trailers and more. It is rated as the best paint for wheel wells because of the professional-grade application. This high-quality formula is corrosion resistant to help protect your metals. Rust-Oleum is a trusted brand that offers a superior barrier from rust on your most precious items. In addition, this formula will even help to deaden sound with the rubberized coating it provides. You can simply paint this on wherever it is needed for added protection. The formula is quick-dry and simple to use. Whenever you need protection from water, salt, and other chemicals, you can rely on Rust-Oleum to keep you safe. You can use this paint can in the black color and is available to purchase in a 32-ounce container. Depending on the size of your project, you may only need to purchase one container. Did you know that POR stands for “paint over rust?” That helps explain why it is the best paint to use on metal. The high-performance coating is specifically designed for application directly on rusted metals. It can also be used on seasoned metals. This POR formula will help you seal and protect the metal surface from salt, water, chemicals, and corrosion. That helps to ensure a longer life of your metal products. With the four available color choices: clear, gray, black and silver, you have plenty of options for whatever project you need to complete. There are also three available sizes that I took notice to. You can grab a container in 1 pint, 1 quart or 1 gallon so there is less waste of unused products. When looking for the best way to paint metal, you really can’t go wrong with this rust preventative coating. It will enable you to enjoy your metal objects for longer due to the lack of chipping, fading and rusting. If you are looking for the best spray paint for metal, CRC makes this formulation that will work great for your needs. It resists chipping and peeling for all metal uses. Your enamel spray paint will dry tack free within 10 to 30 minutes. Within 1 hour, the paint will be completely dry. Using this on automobiles is also a great option. CRC offers great resistance to abrasion, solvents, and corrosion. There are several varieties and colors that you can choose from. For superiority to many lacquer paints, you’ll enjoy the quick durability and flexibility that CRC spray paint offers. Use the CRC All Purpose Enamel Spray Paint on most metal applications. It is also widely trusted in factory and contractor applications. Use this indoors or out for a long-lasting finish. This non-fading and quick-dry coating will spruce up any project you are currently completing. When you don’t want to purchase large cans of paint for on your wheels, buy the best metal spray paint for wheels instead. This aluminum high-heat wheel paint offers a polyurethane paint. Because of this, you receive a specifically designed formula to use on your steel and aluminum wheels. The VHT spray paint offers superior heat and chemical resistance. In addition, it can withstand temperatures up to 900 degrees when cured properly. This unique product is part of a complete coating system. This system consists of primer, paint and clear coat. It could also be the best engine paint as well. Consider the beating your wheels take! You are constantly dealing with the residual from salt, sand, sun, brake dust and rocks. Over time, these elements will cause damage to the appearance and wheel surface. By using VHT, there is additional protection against cracking, fading and chipping damage. In addition, the VHT formula also protects your wheel surface from oxidation. The wheel paint dries to the touch in just 30 minutes, but you’ll want to wait overnight for it to be completely dry. Another great choice as the best car paint is this formulation from Rust-Oleum. Because of the reputable company, you can expect an overall durable, professional finish with this automotive paint. The lacquer formulation allows you stop rust quickly. In addition, it will offer protection from the elements. One can has the ability to cover up to 50-square feet. To make the job even easier, it will dry to the touch in just 30 minutes time. Rust-Oleum Auto Body Paint is a long-lasting, durable gloss formula. It offers the best professional road-resistant finish to keep you fully protected. The high-quality ready to spray system is designed so you can use it on any vehicle. If you desire an even better finish, consider buffing it after painting. There are two sizes to choose from so you can complete any project with ease. In addition, you can choose from colors of brilliant silver, gray primer, chrome yellow and sublime green. Looking for a brilliant pearl effect? The Dupli-Color Metallic Clear Coat is the best paint for motorcycles. It isn’t just for motorcycles, however. You can also use this DupliColor for automotive applications as well. The tiny metallic particles appear suspended in the paint’s finish. This is what created the brilliant pearl effect you desire. Metallic Clear Coat formulation is ready to spray lacquer. Coupled with the fact that there is no mixing required, you are receiving a high-quality, ready to use product. You don’t have to rush to apply the second coat. The DupliColor paint has no re-coat window and is easy to apply. Buff the paint to a brilliant smooth finish. Depending what application you are using it for, there are two color options available to you: Metallic Clear and Prism Clear. Dupli-Color offers a number of varieties of automotive paints. In fact, the DupliColor’s Paint Shop Finish that was reviewed earlier is the best automotive paint. Personally, I think that the Dupli-Color Metallic Special Effects paint would also make for the best metallic paint for walls as well. The best metal roof paint is the Rust-Oleum High-Performance Protected Enamel Oil Base Paint. Roofs aren’t the only thing to paint with this. Consider usage on any exterior or interior surface such as wood, metal, masonry, and concrete. It is an effective outdoor paint because of the weather resistant properties. In addition, Rust-Oleum also resists corrosion which is a common complaint with moisture. The oil-based formula provides you with a durable and protective coating. This protection offers excellent rust prevention for all your projects. One can cover up to 45-square feet. It is also dry to the touch in just 2-4 hours after application. With the exceptional resistance to fading, chipping or abrasion, this is a paint you’ll want to use on everything. As an added bonus, the paint provides a glossy finish for a fresh shine to your surfaces. For long lasting beauty and protection, choose from a variety of colors. Some of these include almond, hunter green, sunburst yellow and more. Combining paint and primer into just one can make this the best metallic spray paint on the market. Whether you use this paint indoors or out, you will notice the ultimate in adhesiveness and strength. Instead of taking two steps to paint your metal surfaces, you can have the beauty of primer and paint all at once. It is also easy to spray with the EZ Touch 360 Degree Dial Spray Tip. Consider using on metal, wicker, ceramic, concrete, wood, glass, fabric and masonry work. It is really that versatile! The Krylon Dual Paint & Primer give a beautiful and durable finish. It combines the two most important painting jobs into every spray. If the silver finish isn’t exactly the shade you were hoping for, there are several other varieties you can purchase. When you are preparing to tackle metal painting projects, follow these simple tips for the best chance of success. Working around a paint can be harmful to your health. Choose a well-ventilated area to protect your lungs from the chemicals. For additional protections, wear gloves and a dust mask as well. Before painting, all the old paint needs to be stripped from the metal surface. As you work, remember to wipe dust and paint particles away with any damp cloth. 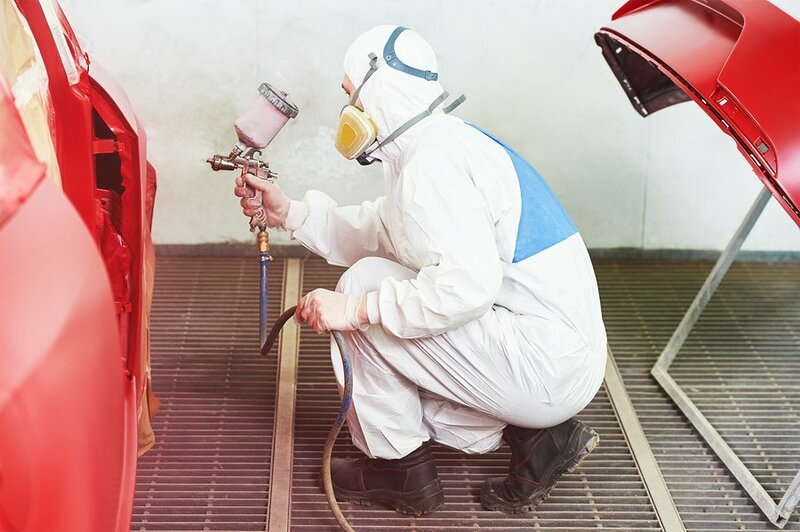 When trying to find the best way to remove car paint to bare metal, you’ll find many options. Some people prefer to use sandpaper. Others will use a wire brush to strip the paint. Sometimes using a mixture of the two approaches is the best option overall. The wire brush is good for large surfaces where the sandpaper can get the tight spaces. Consider also using a cordless drill with the wire brush attachment. This helps those larger surfaces go much faster. If you are using a drill, make sure you wear protective ear coverings at all times. After the paint has been stripped, you will wipe all the dust away with a damp cloth. Then, scrape off any paint that has remained. Even when the metal looks clean, you don’t want to skip this important step. It must be virtually spotless if you want the paint to stick well. Before applying the best paint for aluminum, start with a quality primer. This step is especially important for rusted metal. Ensure that your primer and paint are compatible with each other before beginning. Most primers will come in a spray but look for the bigger cans for larger surfaces. Primer is an important step because it helps the paint to adhere properly. In addition, the primer can smooth out color and texture. Once you’ve chosen the best paint for outdoor metal, follow all directions from the paint manufacturer. When using a spray paint, you’ll do best to only paint a small surface at a time. Otherwise, many paints can be sprayed on with a quality spray gun or choose to use a paint brush instead. If using the brush, don’t overload the bristles with paint or there will be a mess to clean up. Always allow the first coat of paint to dry. While many of them dry to the touch in a few hours or less, it is always best to wait the full time before reapplying. Once you’ve completed all the coats, you’ll want to leave the object where it is until all the paint is dry. This prevents any damage or touch up work in the future. Painting metal isn’t always an easy task. It starts by finding the proper materials to start with. This includes the research needed to find the best paint for metal. Then, you need to follow all application procedures to ensure a job well done. Imagine the pride you’ll have once that project is complete.